I don’t remember your name even though I wore it around my wrist. I don’t remember if you were in the army, air force, navy, or marines. I don’t know if you’re alive or dead—the only things I ever knew were your name and rank engraved on a bracelet. I want to remember that it was copper and left a thin green line around my wrist, but I think the line came from a bracelet stamped with Native American designs I received as a gift when I was ten or eleven. That bracelet came from a friend, I think, or maybe I bought it with birthday money at the shop near the Long Beach marina where my friends and I bought each other strawberry bubble bath and apricot shampoo in tall bottles with fruity scripted labels. I felt grownup pedaling across town and over the bridge and paying with coins and multi-folded dollar bills I kept in a gold-mesh purse. They offered free gift-wrapping at the Village Shoppe—spelled the fancy way—and I’d place the package with its pretty bow under the “mouse-trap” on my bike and peddle home down Pacific Coast Hwy. Lt. Colonel, I never imagined you as a child, like me, a kid who might play baseball with the neighborhood kids on a summer night. Maybe like me you were lousy at batting, but a good runner who liked to steal bases after you were walked to first, and tore up your knees sliding into home. It was my stepmother who bought me the bracelet with your name on it. My sister got one too, a private. I was given the higher rank because I was eighteen months older than my sister. My stepmother—unaware of the precedent my mother and grandparents set, that I should receive the lesser gift because being older I could better handle disappointment—gave me the prize, although I’m not sure I should call your name inscribed in nickel, a prize: It meant you were a prisoner of war, or missing in action. I don’t know if I knew which. My sister and I were the first girls at McGaugh Elementary to wear POW bracelets, refusing to take them off when we bathed, swam, slept. We took gymnastics lessons and as I twirled on the uneven bars, the bracelet slid up my wrist onto my arm, the open sides digging into the tender flesh as my muscles flexed and tendons tightened while I gripped and spun, leaving angry red marks on the inside of my wrists. I’d like to think my small suffering in some way helped to relieve yours, but I know it didn’t. I’d like to say I prayed for you, but we weren’t churchgoers and the only prayer I knew was one I invented to ward off intruders when my mother left my sister and me alone overnight to sleep with her boyfriend. I’d like to say I thought about you, but you were an abstraction. I was eleven or twelve and I pictured you thirty like my father who was a lieutenant in the Los Angeles County Sheriff’s department. Now, I think it’s more likely you were in your early twenties. Maybe you enlisted. Maybe you were drafted. You were just a regular guy, working in the shoe department at J.C. Penney, saving money for college when your notice came. Maybe you had a girlfriend, a high school sweetheart you were going to marry once you were promoted to assistant manager and could afford to rent a house. Or maybe, and I hope not, you married young, too young like my parents, and you joined the army so you could get a paycheck and job training and go to college on the GI bill and buy a home with a VA loan. But somehow you got trapped in the jungle. It must’ve been hell, at least that’s the picture I got from my stepfather. He was a prisoner twice, caught by the Viet Cong, thrown into a cell—bamboo if I remember it right from his stories. Both times he escaped. He did it, as he liked to tell it, by pretending he was dead. He taught himself to slow down his heartbeat—a mind over matter trick that also kept him from going crazy. It took months, but finally his captors mistook him for dead. I don’t remember now if they pitched him into the jungle to rot, or if they left his cell unlocked while they called another guard or a medic to come with a stethoscope, or if he used the element of surprise, a dead man springing to life, and fought them off. I don’t remember if he shot anyone, stabbed anyone, killed anyone, but I do remember the shrapnel scars on his chest and bicep, the bullet holes slick and shiny unlike his regular skin, lined and circle-burst at the edges. He liked to talk about his capture, his escape rather. Every friend of mine heard his story over dinner, or on a camping trip, or sitting on the couch watching black-and-white episodes of Sherlock Holmes. He’d peel off his T-shirt offering his scars for the touching. He couldn’t feel them anymore. I didn’t wonder then about other things he couldn’t feel. I suppose he should have scared me when, the first night he moved in with my mother and me, he said, “Don’t ever wake me up while I’m sleeping. I might think you’re VC and kill you.” But he said it in a voice that sounded like a Wolfman Jack’s, a voice I’d spoken to dozens of times on the phone before I met him. And so if I woke in the night and heard a noise I kept my panic to myself and kept out of my mother’ bedroom, which wasn’t a change because my father, when he lived with us, kept his gun in his sock drawer when he was off-duty and their room was off-limits. And you Lt. Colonel, did you have a place to come home to? And if you did, did you charm a young divorcee, lie about your age, pretending you were older so she would marry you? Did you endear yourself to her children, shower them with attention they never had? Did you have a giant circle of friends and family and ride dirt-bikes at Agua Caliente and charge over dusty brown hills in Ensenada in your Ramcharger while your new wife screamed and braced herself against the dashboard and your oldest stepdaughter slid out of her seatbelt and onto the floor laughing with the thrill and danger of it all? And who Lt. Colonel did you warn to stay away from you? And what did you do when you came home, if you came home, when the horror of the war got to you? Did you wake screaming and sweating next to a wife who had no idea how to comfort you? Did you leave your bed and patrol the halls at three a.m. and stand in the doorway of your oldest stepdaughter’s room and watch the quilt over her chest rise and fall ever so slightly and wonder if you put your hand there if you could teach her with just the slightest pressure to stop breathing, to stop feeling, to pretend she was dead and somehow escape? Lt. 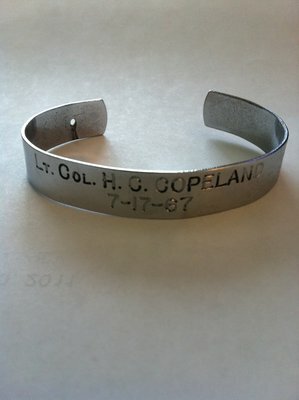 Colonel, your name, my bracelet, snapped in two, hit too many times against the concrete deck of my father’s swimming pool as I pulled myself out of the water and onto the scratchy cement, lying corpse-like in my chlorinated puddle until my skin dried taut. If I could’ve thought beyond the cinder block fence that divided my father’s backyard from Seal Beach Boulevard and the boulevard from the Naval Weapon’s Station beyond it, I might have wondered if you’d become a career military man and been assigned to this base after the war, moving with your wife with her Mary Tyler Moore hair and big sunglasses, enrolling your daughter at the school just across the barbed-wire, just across the boulevard, just two short blocks from my father’s house. Your daughter would like me because I could outrun any boy on the playground, and your wife would like me too, because my father was a sheriff and I would call her Mrs. Lt. Colonel and say please and thank you. The author in a 7th grade collage. I think your daughter would invite me over, just once before you moved again at the end of the school year, and we would walk past the guards and the barbed wire to your house made of cinder blocks, but you wouldn’t have a fence, just green grass on a gentle slope and further away, grass covered mounds behind more barbed wire where we couldn’t play because the missiles where there underground and we could get blown up. And Lt. Colonel, you’d come home just before dinner, wearing a spiffy uniform like my father did, with pins and stripes and symbols and your name written across your chest, but it would look different on the crowded cloth than it had on my wrist, smaller and less lonely on a live man than my skinny arm. Your live arm would hold a Budweiser and a cigarette would dangle from your lips. You’d stand just inside the doorway, carefully removing your shoes, lining them against the wall, recalling that the ones you bought at J.C. Penney before the war had better arch support, that you could stand in them all day no problema. 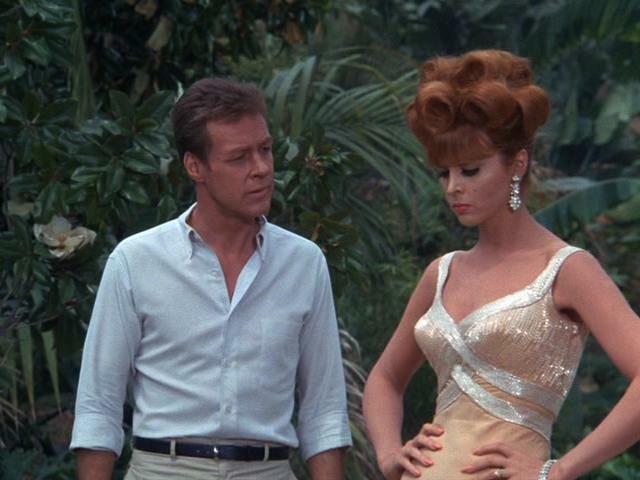 You would sit on the couch with its scratchy plaid cushions, your daughter next to you, and me next to her, and we’d watch Ginger flirting with Professor Hinkley on Gilligan’s Island and you’d snort and say they didn’t know crap about how to survive when they were marooned and ask where she got that evening gown. Or maybe you’d think all that, but not say it, not want your daughter to ask “Daddy?” or say “Da—ddy,” and grab your beer can and set it on the coffee table. Then Mrs. Lt. Colonel, apron tied at her waist would invite us all to sit down, as if we were company. Were you the kind of man who didn’t say, “Just a minute,” but turned off the TV in the middle of an episode? I think you are. I wouldn’t be surprised at all Lt. Colonel if you were also the kind of man who sat at the table and looked down at your plate and asked us to hold hands. You’d reach for my skinny tan fingers with your pale firm ones. Then while I felt our palms throb as if we held one of our classroom mice between them, I think you’d say something to God and then Amen and when I let go of your hand, I’d see your sleeve pulled up at the wrist and notice that you too wore a bracelet with a name on it, just like mine before I broke it. And before you saw me looking, you’d brush your thumb across the name, as if it were braille, as if you could absorb the soldier by feel, and then I’d hope that my friend’s father was really you Lt. Colonel, and that you had come home and weren’t going to kill anyone if they woke you up wrong, or touch anyone at night when they were sleeping because you were still in a jungle still at war still trying to escape. I kept the two halves of that broken bracelet for years, until I grew up and packed for college and took that box with me, everything but the broken bracelet inside. I threw it in the trash. What does it say about me that even then, Lt. Colonel, I’d already forgotten your name?